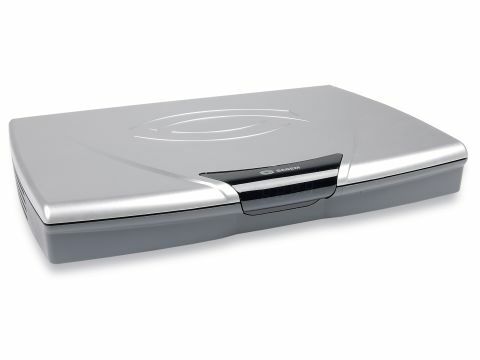 This is the third Sagem PVR we've reviewed in three years and long-term readers could be forgiven for thinking they've seen it all before. That's because three years on, Sagem has kept its latest batch of Freeview PVRs looking pretty much the same. The 64250 again resembles a folded-up, budget-priced laptop but it has swapped the garish red LED readout for a friendlier amber effort, albeit one that still displays words such as Menu in a tacky way ('MEnu'). Although the PVR lacks operating buttons for those prone to mislaying their remote, it is at least a good deal thinner than many Freeview recorders we've tested and is quiet in operation. The rear panel keeps things simple with a UHF loopthrough (there's no modulator), two Scarts with RGB and composite out on the TV Scart and S-video and Composite on the VCR Scart and both co-axial and optical audio outputs, but no stereo phonos alternative. On the right side of the receiver is a USB port which can be used to play back and transfer music and image files from connected devices such as a USB memory stick, but not to transfer recordings from the hard disc to a PC. It can also be used to charge portable devices such as MP3 players. The slim remote control has an off-the-shelf feel about it and is reliant on similarly sized but easy-to-fathom buttons. The software has had an overhaul from previous models. Your jump-off point is a quirky central scrolling menu comprising large icons whose function is detailed at the bottom-right of the screen when selected. This takes a getting used to, but there are dedicated buttons for most major menu options on the remote for speedier access. Up to seven favourites lists of TV and radio channels can be created and there's a picture-in-picture mode to let you view what's on a second channel in the top-right of the screen. The EPG has the selected channel running in the top left-hand with a programme summary and progress bar on the right. Beneath this is scrollable list of nine channels at a time. Selecting a channel brings up a scrollable list of programmes for the next seven days on the right that can be skipped through on a day-by-day basis. As is common on many other PVRs, we would have preferred to see a grid of channels allowing you to see what's coming up on several channels at the same time. Sagem has packed a generous 250GB hard disc into the 64250, which is enough for about 125 hours of recordings. Recordings can be instigated when hitting record while watching a show via the EPG or using the manual timer with once daily and weekly repeat options. You can also set a buffer up to 15 minutes at the start or end of a recording. Dual recording is possible and you can also watch a recording from the start while it's still being recorded. In-progress and completed recordings are viewable in the recording list menu and you can rename, merge them and also edit out chunks, although the latter is a fiddly process. The PVR keeps a running cache of what you watch, lasting up to two hours, which can be committed to the hard drive afterwards by pressing record. Recordings and timeshifted material can be smoothly fast-forwarded and rewound at 4x 10x 60x and 300x normal speed. Unfortunately, the tuner is one of the least sensitive we've come across; it struggles to pick channels from multiplexes other than 1 (home to the BBC channels) when our Sony IDTV at the same location had no problem at all. Even when signal strength and quality is above average, pictures exhibit a smooth sheen of blockiness and noise. The PVR failed to recognise our portable hard disc when connected via the USB input but had no trouble reading a flash memory stick. It played JPEG images and MP3 audio files directly from the latter and music can be playlisted and photos viewed as a slideshow. Files of both types can also be transferred to the hard disc and placed in folders. Audio quality is crisp for MP3s, especially when using the digital audio outputs. But although it would be wrong to expect HD quality results, our hi-res picture files still look rather jagged when piped through the RGB Scart. The 64250's multimedia capabilities and big hard disc promise much, but its Achilles heel - its lacklustre tuner - is something that probably cannot be fixed by a software update.